Ava Dove on her first day of gymnastics!! Ava Dove is a beautiful,blue-eyed, & spunky four year old. 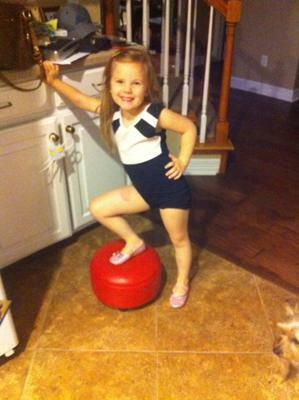 She enjoys gymnastics,swimming,playing with her dog Lola & playing with her friends Addy,& Allison. She's smart & learned big words at an early age. Her favorite singer is Justin Bieber & she would like to meet him one day. I encourage you all to vote for Ava because you're not going to find a four year old quite like her. We have never entered an online competition before. The reason for entering this competition is because, I have had alot of friends, & family suggest it. I was scared to enter her at first, but I'm going to go ahead & do it. Thank You all for your support!! !